Chinese-born American clarinetist Jun Qian joined the music faculty at Baylor University in 2012, when he was also appointed principal clarinetist of the Waco Symphony. He was the featured soloist with the Eastman Wind Ensemble on the opening concert of their 2014-15 season. Qian won first prize in the International Clarinet Association’s Orchestral Excerpts Competition and third prize in its Young Artist Solo Competition in 1997 – the first artist in the history of the ICA to receive prizes in both competitions in the same year. He was also the second prizewinner in the Texas Young Artists’ Competition, and first prizewinner in the Baylor Symphony Orchestra 1998 Concerto Competition. His CD Première Rhapsodie (1998) and DVD Playing the Clarinet (2004) were released under the Nanjing Shine Horn label in China. Dr. Qian served as clarinet professor at St. Olaf College in Minnesota, and prior to that, he taught at Nazareth College, Houghton College, and New York State University at Fredonia. Other experience includes teaching music theory at the Eastman School of Music and chamber music at Shanghai Conservatory of Music (China), where he also performed as principal clarinetist of the Shanghai Philharmonic Orchestra. In the spring of 2007, Qian served as music producer and soloist for Steven Laitz’s book The Complete Musician (second edition), published by Oxford University Press (USA). An endorsed artist for both Selmer of Paris and D’ Addario of New York, Qian has appeared as a concerto soloist with the Shanghai Symphony Orchestra, the Eastman Wind Ensemble, the Shanghai Philharmonic, the Xiamen Philharmonic, the Pueblo Symphony Orchestra, the Baylor Symphony Orchestra, the Eastman Chamber Orchestra and the Shangyang Opera Orchestra. He has introduced Chinese audiences to a number of Western clarinet solos in full orchestral versions, among these Donato Lovreglio’s La Traviata Fantasy and concertos by Aaron Copland and Malcolm Arnold. In 2001, Qian made his Carnegie Hall debut, performing Weber’s Clarinet Concerto No. 1. National and international appearances as principal and guest principal clarinetist also include the Eastman Wind Ensemble’s tours of Asia in 2000 and 2004, Central Wisconsin Symphony, the North Carolina Festival Orchestra’s European tour, the Kent-Blossom Music Festival (student guest principal with the Cleveland Orchestra), the National Orchestra Institute (USA), the American Wind Symphony, and the Binghamton Philharmonic. In 2004, Qian was the featured soloist at the Kyoto International Performing Arts Festival in Japan, and appeared on National Public Radio’s “Performance Today” with the Grammy-award winning Ying Quartet. Since 2006, Qian’s activities as a teacher and performer have included a clarinet recital in Paris, France; conducting the Nazareth/Houghton Clarinet Choir as part of the International Clarinet Choir Festival in Rochester, New York; and numerous concerto appearances and master classes throughout China, Malaysia, Singapore, Taiwan, Canada, and the USA. In 2009, he performed a chamber and solo recital in Shanghai, China, with Japanese violinist Yayoi Toda, first prizewinner of the Queen Elizabeth Competition. Dr. Qian was also invited by the Singapore Ministry of Education, Singapore National Youth Orchestra, and Singapore American School to give a solo recital and several master classes. In 2011, he performed solo recitals in Shanghai, Taipei National Concert Hall, the ICA Clarinetfest conference in Los Angeles, and at the College Music Society International Conference in South Korea. In 2013, he was invited by Selmer (Paris) Company to perform a solo recital and give a master class among international students in Paris, France as we as the ICA Clarinetfest conference in Assisi, Italy. In addition to performing the standard clarinet repertoire, Dr. Qian also collects, performs, records, and commissions new music for clarinet by Chinese composers. Those compositions – written by well-known composers born in China or raised in a Chinese family (e.g. Chen Yi, Bright Sheng and Zhou Long) – explore the confluence of Chinese cultural elements and Western art music. Collectively, they have gleaned an impressive list of international accolades and accomplishments. The release of his first CD in the US, East Meets West – Clarinet Music by Chinese Composers (Albany Records,Troy1377, 2012) represents the culmination of the first major phase of this work. Dr. Qian also performed this music in a solo recital at the ICA Clarinetfest 2013 conference in Assisi, Italy. His second CD of the same series- East meets West II- Clarinet Music by Chinese Composers overseas (Albany Records, Troy1528) was released at the end of 2014. 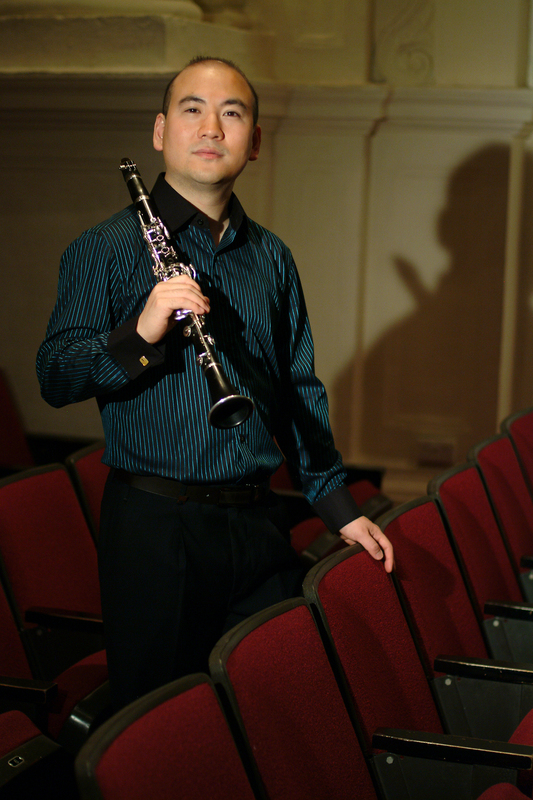 Dr. Qian holds a Bachelor of Music in Clarinet Performance from Baylor University where he was a student of Richard Shanley, a Master of Music in Clarinet Performance and a Doctor of Musical Arts from the Eastman School of Music where he studied with Kenneth Grant and was the last private student of Stanley Hasty. Dr. Qian is the founding director of Baylor Clarinet Choir and Chamber Music Festival, Virtuosi Chamber Winds, a group specializing in large wind chamber music, and the Amadeus Youth Clarinet Ensemble, a training ensemble for high school students in the USA. One of his undergraduate students from Baylor University, Jake Hale, has just won the first prize of the 2015 International Clarinet Association Orchestral Excerpts Competition in Madrid, Spain and the principal clarinet (core) position of the Shreveport Symphony Orchestra, in Shreveport, Louisiana.